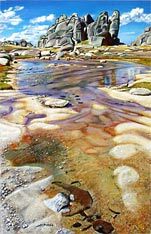 Alpine environments are very rare in Australia, occurring only at high elevations in the south east of NSW, north east of Victoria and part of central Tasmania. Only there can you see Australian landscapes that have been carved by glaciers. Glaciers have exposed and shaped the underlying rock core of the mountains. Snow Gums are the main eucalypts that survive at these altitudes and during late summer their bark changes to vivid colours. But as elevation increases up the mountains, even the Snow Gums can't survive and the alpine vegetation becomes a diverse mixture of forbs and grasses. 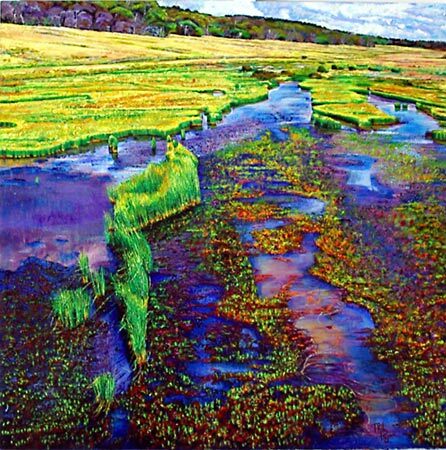 Summer brings a diversity of colour, form and texture in this ground vegetation that is unlike any other Australian environment. It is quite different from the alpine country of western US or Europe. 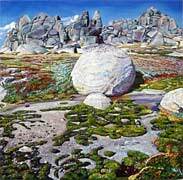 There is further commentary on the alpine vegetation with the Snow Gums and other alpine vegetation series. 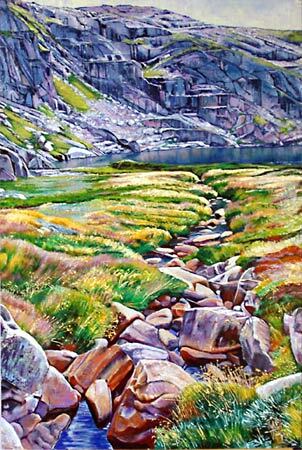 Water is the other critical feature of this alpine environment. Winter snow packs are the source of many of Australia's major rivers. This water resource is harvested for power by the Snowy Mountains Scheme and then becomes the critical resource for various inland irrigation schemes. 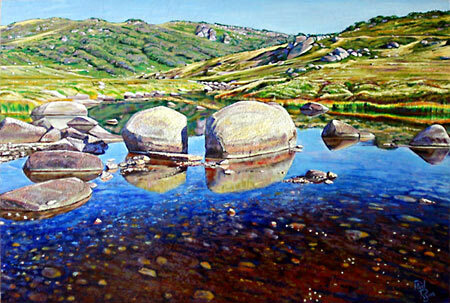 Blue Lake is the largest cirque lake in Kosciuszko National Park NSW. A cirque lake is one that has been craved out by a glacier producing a depression in the side of a mountain like that produced by a huge icecream scoop. All cirque lakes have a common landform of a steep, scoured rock face on the upslope side, a small near circular lake in a narrow flat basin, and an open mouth often dammed by glacial rock debris (moraine). At Blue Lake, there are actually two cirque basins but the upper one has been filled in with sediment. 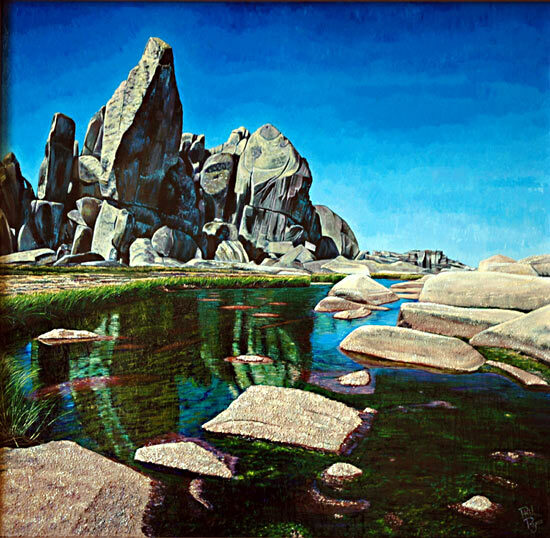 The Blue Lake Trilogy takes the theme of cirque morphology and all three paintings have the steep background glacial rock scarp, a flat basin mid ground, and a rocky moraine foreground. 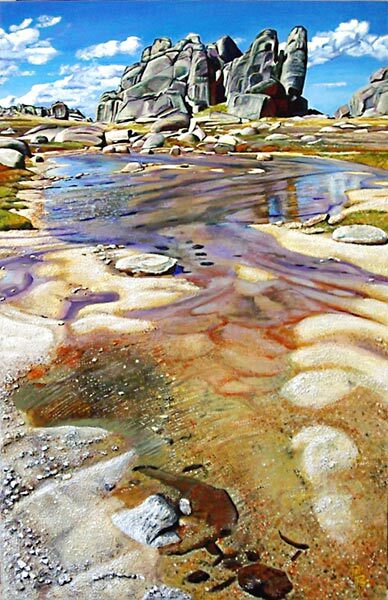 Water also links all three paintings. 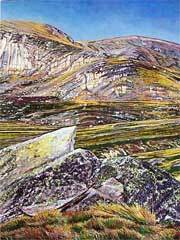 The trilogy also displays the diverse alpine ground vegetation found above the tree-line. Another type of alpine lake produced by glaciers is called a tarn. There is a shallow basin above 2000m ringed by North Rams Head and Rams Head peaks and at the centre of this depression is a small tarn. The basin is ringed by rocky outcrops with quite peculiar shapes formed by ice and erosion. Within the basin there were contrasting boulders deposited by the glacier. At this elevation the vegetation is restricted to diverse low lying plants which have varied summer foliage colour and can form specific patterns. North Rams Head Tarn 1, North Rams Head Tarn 2, North Rams Head Tarn 3 and North Rams Head Tarn 4 focus on different aspects of this landscape but all have a water link and make use of variable texture to enhance perspective. Three Mile Dam was originally created by the Kiandra gold miners to provide water for gold sluicing. 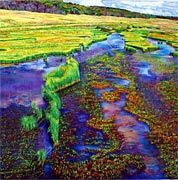 The upper reaches are shallow and have been colonised by various reeds and other aquatic plants producing varies colours and patterns. Three Mile Dam is at a lower elevation, 1400m, than Blue Lake or North Rams Head so the vegetation is more sub alpine; snow grass and snow gum. 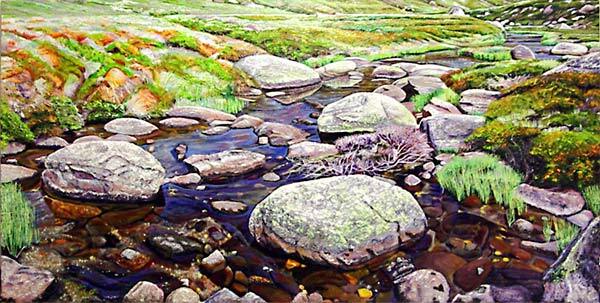 Spencers Creek is one of the main watercourses that you cross on the Kosciuszko Road between Perisher and Charlotte Pass. It flows into the Snowy River above Guthega Pondage. The river valley is board with several terraces covered with snow grass. But the presence of large rounded boulders in a relative small stream means that the water flow can be formidable during spring snow melt. Spencers Creek 1 and Spencers Creek 2 show different aspects of this alpine stream. 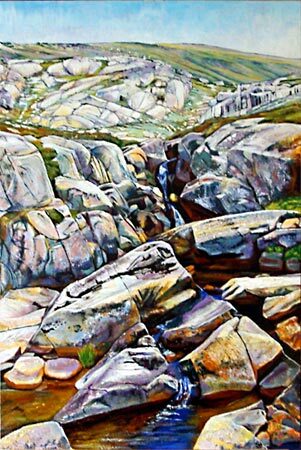 Walking along the Summit Walk from Charlotte Pass to Mt Kosciuszko you cross the Snowy River near its source in the Rams Head Range. At near 2000m elevation this is a very different riverine environment to Spencers Creek. 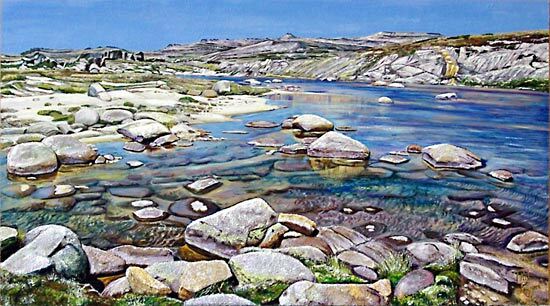 It is a more severe, stark landscape with expose bedrock, sand banks and numerous boulders. What is surprising is how board (and mature) the river valley is so close to its source. No steep V-shaped valleys here. 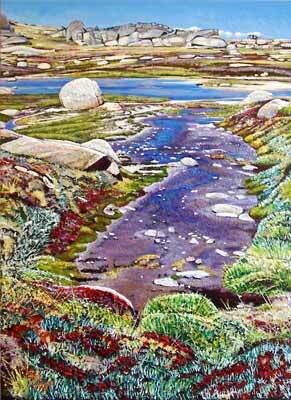 Snowy River, Rams Head Range depicts the upper Snowy River and one of its small tarns. Looking south east towards the Rams Head Range shows one of the striking features of the Kosciuszko alpine environment, it is a very old worn alpine plateau in contrast to the younger, dramatic alpine environments of New Zealand or western USA. 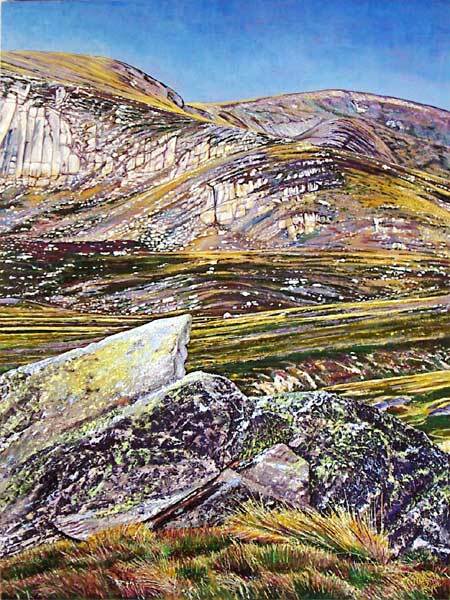 The spine of the Kosciuszko National Park is the Main Range. 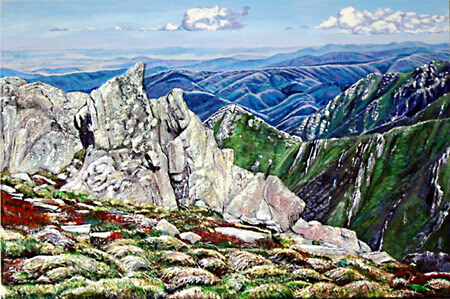 The Main Range depicts a section of the Main Range north of Mt Kosciuszko as seen from the Blue Lake Track. Shown is the section from Mt Northcote to Mt Lee that shows old rounded mountains that have been scoured by glaciers, exposing the bedrock. 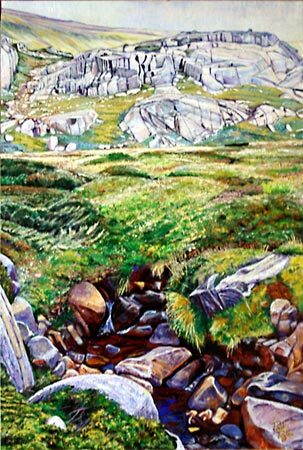 The textures produced by the exposed rock in contrast to the alpine ground vegetation produces a scene characteristic of Kosciuszko. Other parts of the Main Range are shown in Mt Sentinel and Signature Hill Bluff. 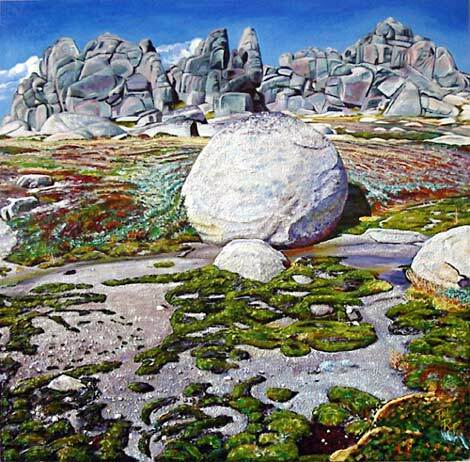 Signature Hill is a rocky escarpment seen to the west of the Kosciuszko Walk from Thredbo Top Station. On Signature Hill there is a sharp contrast between the outcropping bedrock that has been scoured by glaciers and ice fields and the transported boulders deposited by the glaciers. 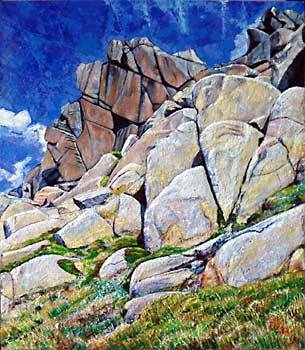 This painting depicts these contrasting rock shapes, textures and colours against the deep blue of an alpine sky. Mt Sentinel is found on the NW corner of the Main Range track. Here the rock has changed from granite to steeply tilted metamorphic strata which outcrops as linear spines.